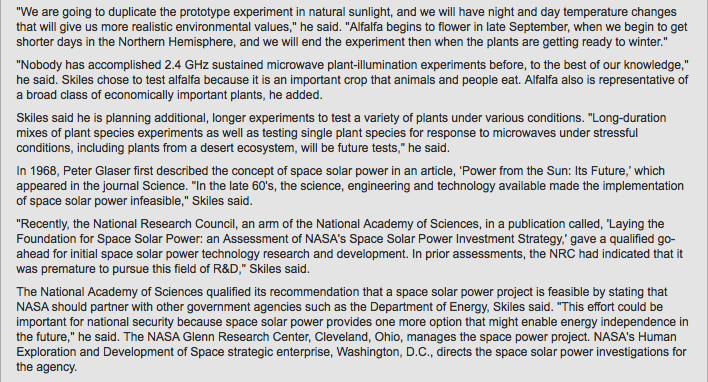 A NASA scientist has discovered that future solar-power satellite systems designed to harvest sunlight, convert solar electric energy into weak microwaves and beam them down to Earth to make electricity, are not harmful to green plants. During the simple experiment, the scientist bathed a tray of alfalfa plants with weak, 2.45 GHz microwaves for seven weeks with no ill effects. The microwaves were about 1 million times weaker than those an average kitchen microwave oven makes. The test took place in a laboratory at NASA Ames Research Center in California’s Silicon Valley, and is the first of many experiments scientists plan to conduct to see if an array of solar-power satellites designed to send microwave power to Earth could affect plant life. “A tray of growing plants was illuminated with microwaves while control plants were grown behind a microwave-opaque shield. 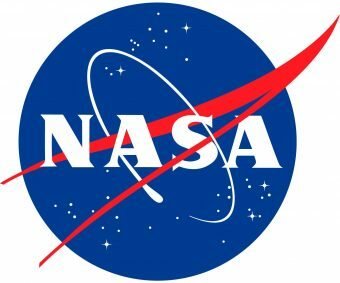 Test plants and the control plants were subjected to the same environment otherwise,” said NASA Ames scientist Jay Skiles, who designed the experiment and recently presented its results at the 54th International Astronautical Congress in Bremen, Germany. “In all measured variables, there was no difference between the control and the microwave treatment plants,” Skiles added. A ‘control’ is a parallel experiment in which the factor being tested in the main experiment is left out in order to provide a way for scientists to judge that factor. In 1968, scientists proposed putting solar-power satellites into orbit about 22,000 miles above the ground, where these spacecraft could harvest sunlight for its energy. While the satellites would collect sunshine to make direct current (DC), they also would be converting the DC to some form of radiation, most likely microwaves. The satellites then would broadcast the microwave energy to the Earth’s surface, where power plants would reconvert it into electricity for distribution. “Over the ensuing decades, the space-power satellite concept has been studied from the view of engineering feasibility and cost per kilowatt, with only little attention paid to the biological consequences to organisms exposed to continuous microwave radiation,” Skiles said. 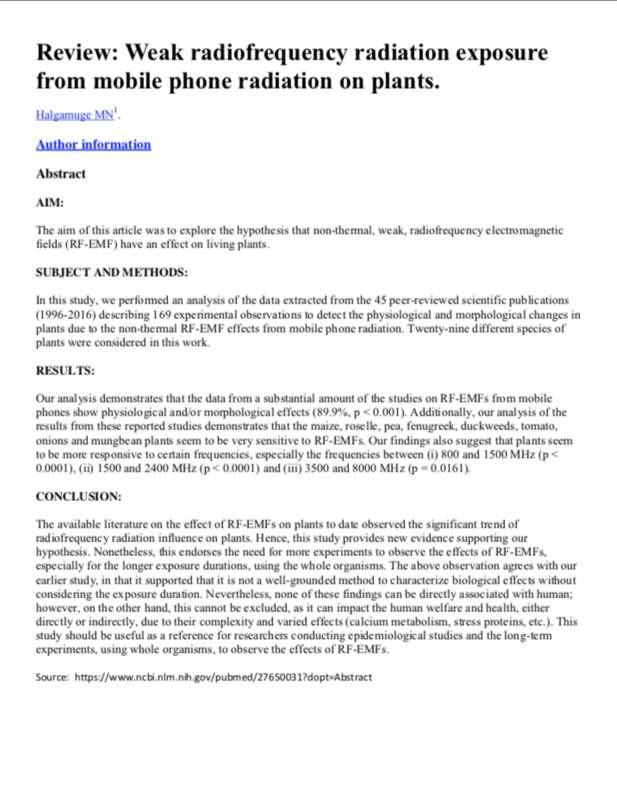 “The hypothesis of my experiment was that plants exposed to microwaves would be no different from those plants not exposed to microwaves,” he said. Skiles used off-the-shelf equipment to conduct the experiment. He used the same nutrients and watering techniques on two sets of plants, only one of which was exposed to microwaves. A microwave generator with an antenna and a parabolic reflector beamed microwaves onto the test plants from the side so as not to block lights placed above the plants. A sheet metal microwave shield protected the ‘control’ plants from the microwaves so Skiles could compare the non-microwaved plants with the microwaved plants. Skiles measured the chlorophyll concentration of the alfalfa leaves in the microwaved and non-microwaved plants. He measured the plants’ stem lengths, and also harvested, dried and weighed the plants. 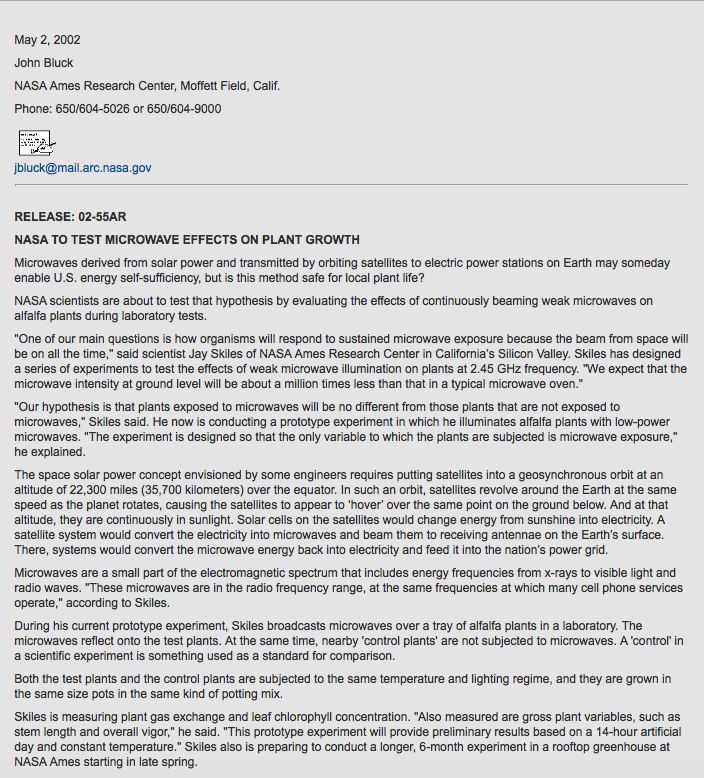 He found there were no significant differences in the microwave-treated plants and the untreated control plants. Skiles chose to test alfalfa because it is an important crop that animals and people eat. Alfalfa also represents a broad class of economically important plants, he added. Skiles plans to conduct additional experiments to test plants outdoors, as well as under other conditions. “I want to test plants growing in a glasshouse to determine the effects of microwaves on the plants during daily changes of light and temperature,” he said. “Another experiment will be to grow cereal plants, including wheat and oats, to determine the effect of microwaves on the kinds of plants that humankind depend on for food,” Skiles continued. He also plans to test whether or not microwaves provide a competitive advantage for some kinds of plants when several different species are growing in the same area. In another experiment, he is planning to examine the genes of one plant species to learn the effects of weak microwaves on that plant. Additional experiments to test effects of climate change, watering and other conditions also may be conducted, according to Skiles. NASA’s Office of Space Flight Advanced Concepts funded the microwave study.